match-fixing scandals to report (like right before the 2006 World Cup), no illicit betting to speak of (like right before Euro2012), and even the inquest into coach Cesare Prandelli's team selection has been mild by Italian standards. Simply put, the expectation around Italy hasn't reached an unhealthy crescendo--yet, at least. Perhaps it will come if the boys in blue get to the quarter-finals or beyond. For now, Italian fans see the World Cup as respite from the mediocrity that has engulfed Serie A for a few years now. The fall from grace has been agonizing and inexorable for a league that used to be the undisputed pinnacle of the sport for so long. Now, it lies 4th in the UEFA coefficient ranking, fighting to stay there. The national team is, after so many years, one bright thing, one that has to be nurtured, cherished, not anymore dissected for its inadequacies. It stands as a paradox: in defiance of the declining domestic game, a giant to be reckoned with internationally. It was only two years ago that Italy dismantled fancied Germany and came to within a game of winning the European Championships. Euro2012 was Prandelli's signal intent, a proclamation of his mettle, and this cannot be overstated because let's face it: Gianluigi Buffon, Daniele De Rossi, and Andrea Pirlo apart, this Italy doesn't have tricks that can't be tamed. 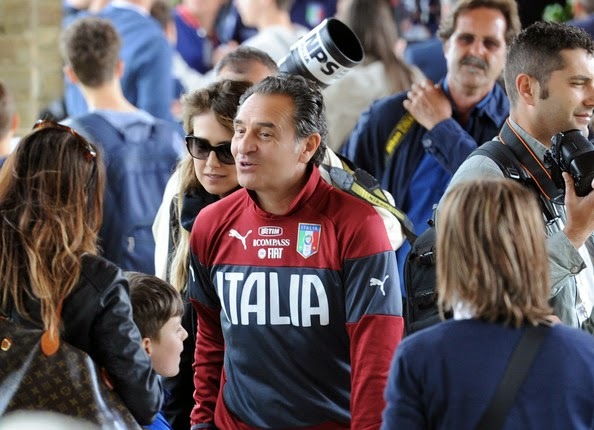 As Prandelli calibrates his charges in Coverciano, the main quandaries, the media seems to agree, are who will make the cut in attack out of Mario Balotelli, Antonio Cassano, Ciro Immobile, Mattia Destro, Lorenzo Insigne, and Giuseppe Rossi and what formation the coach will put out. These sorts of debates, selection aches and pains, de rigueur for other countries, are a welcome departure when it comes to Italy, and what is refreshing is that those debates are not being staged in a crucible. Even the players have adopted the right vocabulary before the World Cup. "The quarter-finals or beyond will be a great World Cup," said captain courageous Buffon. "We have to understand that we are below the level of teams like Germany, Brazil, Argentina, and Spain." Not exactly bellicose, and, rest assured, totally by design. Italy are savouring their relative anonymity heading into the World Cup in Brazil. It is almost taken as de facto that the Italian public expects a semi-final appearance at least for a tournament to be remotely successful. This time, there is no such anticipation--either from the fans or the pundits. However, rest assured, Italy does indeed have the material to get to the semi-final of the World Cup, and even, if Balotelli is in the mood and Pirlo is his usual otherworldly self, win the tournament. Big ifs, especially given Balotelli's capriciousness and Pirlo's ageing legs, but ifs that have to be taken into consideration--quietly, if you are an Italy faithful, away from the media glare, of course. The only man who dared to glimpse triumph openly was Marcello Lippi, who drew comparisons in spirit between his 2006 World Cup winning side and the current one. But that has been it, really. Instead, now the focus is on technocratic elements like how to replicate the playing conditions in Brazil, and, as Demetrio Albertini was eager to point out, how to reserve the team's stamina for the crucial moment. A crucial moment like a Final, for example. Not that Italy expects to get there.